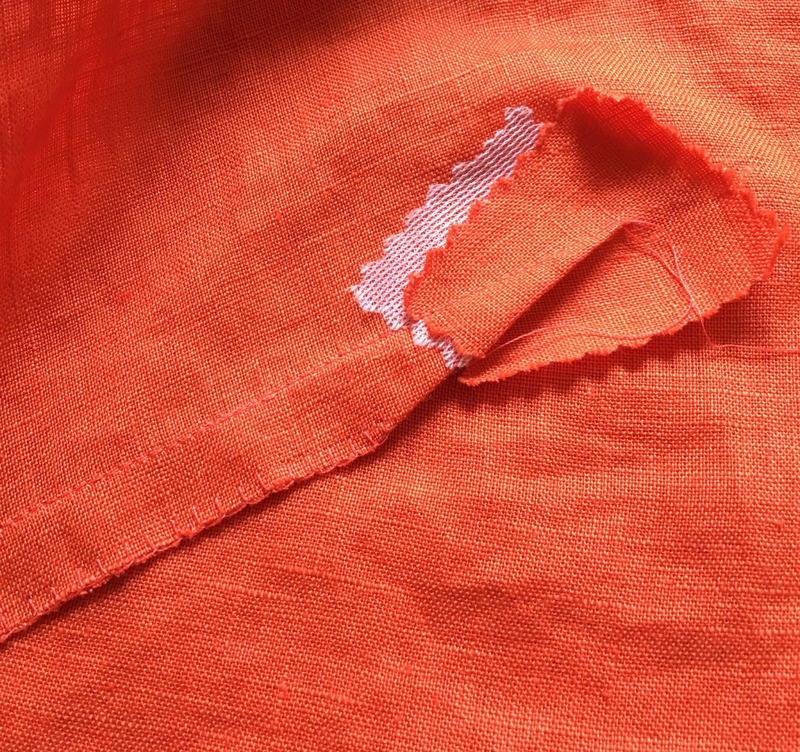 Since summer is in full swing, I have been very much in the mood to sew with linen despite its tendency to wrinkle. 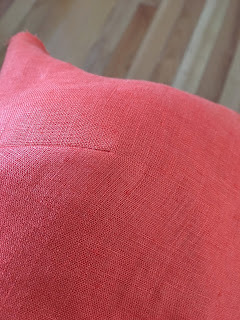 I find that if you wash linen in a washing machine and dry it on a hot setting, the linen still wrinkles but it does so softly so that is what I did. 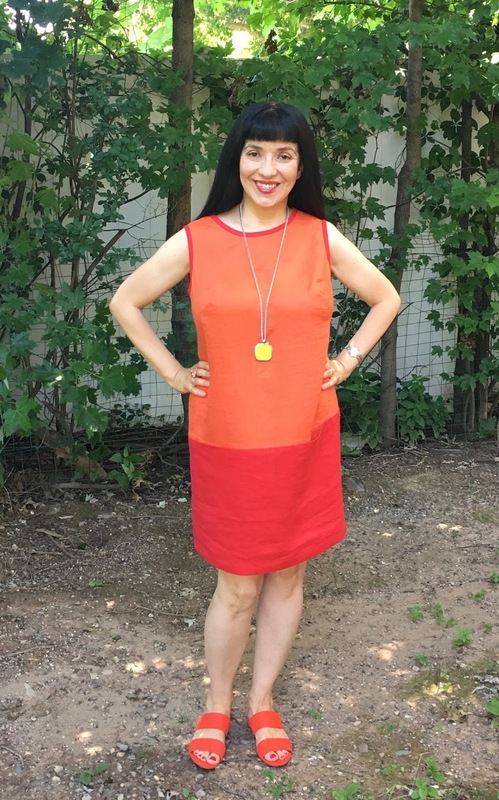 McCall's 7562 was the inspiration for this dress. I love the colors chosen for the sketch of View B. However, I did not want the neckline and sleeves illustrated. I also wanted the top orange section to be longer so that the style line did not cut me in half so to speak. I recently received a fashion book as a gift that had pictures of shift dresses from the 1960's. I was a toddler then but still remember my mother sewing shift dresses for me and my sister. Nostalgia set in so I decided to make a 1960's inspired shift dress. 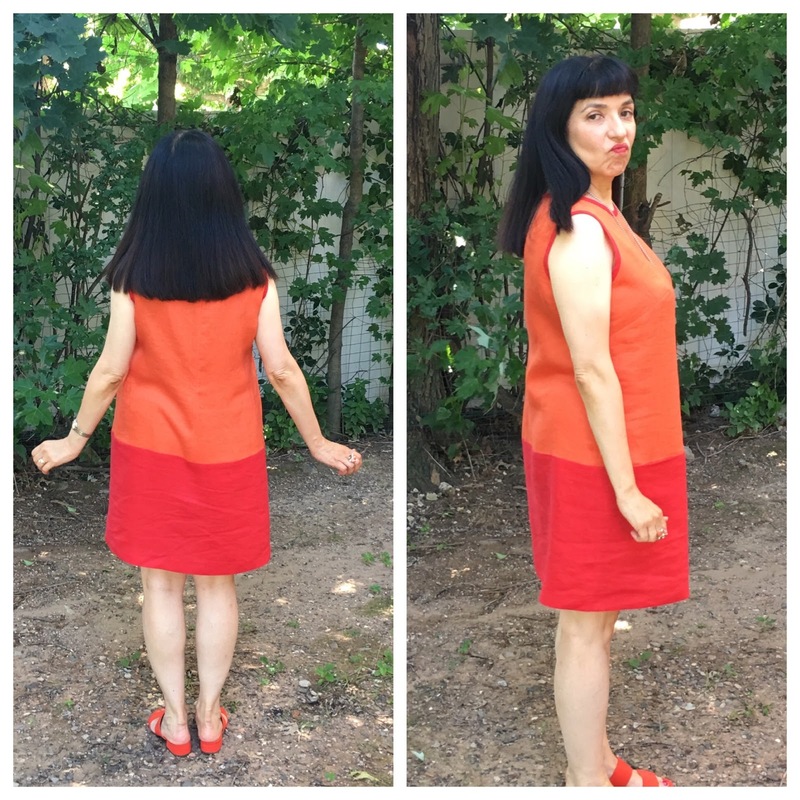 I drafted the top section and bottom section of the dress but I used the pockets from McCall's 7562. I thought this dress would be one of those easy-to-make summer dresses...oh so carefree...comfortable and perfect for a hot summer day! For me, the raw edge of linen feels scratchy to my skin. 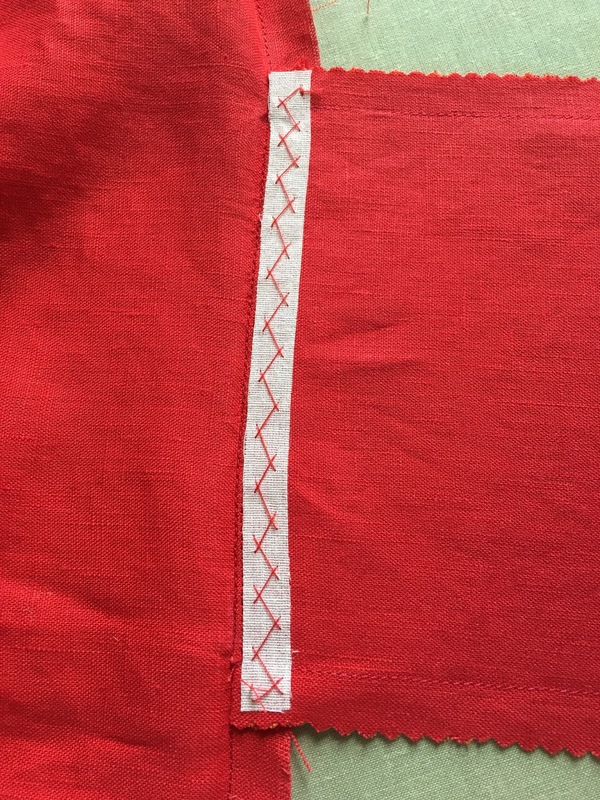 I have tried in the past finishing linen edges with a serger but it still feels scratchy. I therefore decided to finish the edges using a Hong Kong finish. It resulted in a beautiful finish in the inside but it did take some time to cut the bias strips (out of Bemberg lining fabric) and apply them. Since the linen is lightweight, I also thought it would be a good idea to line the red bottom section to make sure there was no see-through. Another issue I encountered was the bust darts. Since I am a bit top heavy, the dress required that I make a huge dart for it to hang correctly. 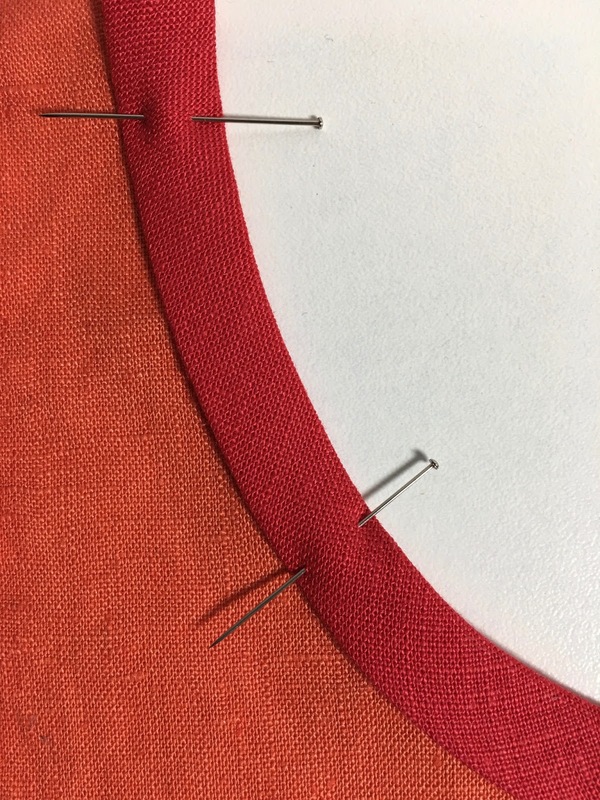 However, no matter how carefully I sew a large bust dart, there is always a rather noticeable bubble that forms at the dart point. 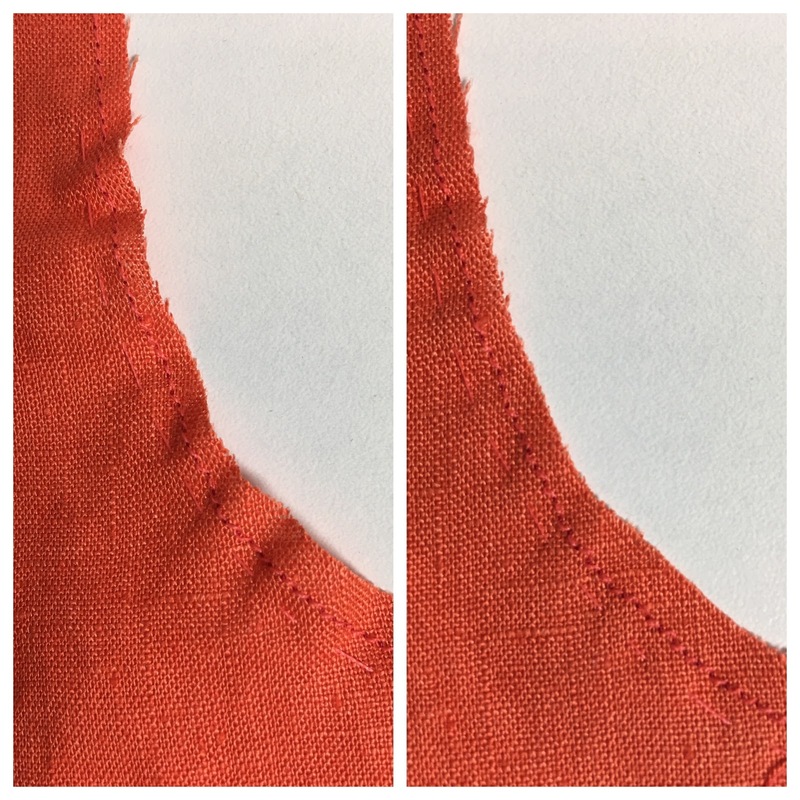 In an effort to minimize the bubble, I tried using a technique suggested by Virginie of the blog Jazz Couture where she recommended that you fuse interfacing to the end of the dart. I tried that but I still had a rather large bubble. I also read in a Sandra Betzina book (don't know which one) that sewing a small piece of fabric to the end of the dart would eliminate the bubble. I have tried that in the past as well and still got a large bubble. I am sure each technique would work on its own were my dart not so massive. So this time, I combined both techniques and had a much better result. Thank you Virginie and Sandra Betzina! Now yet another issue was the large dart take-up which you can see in the above photo. I did not want that large expanse of fabric to show on the right side so I trimmed the dart and finished the edges by hand with a blanket stitch. I thought that serging the dart would result with a ridge showing on the right side so that is why I chose to do a hand blanket stitch. Here is the right side of the dart freshly pressed. In the wearing of the garment, I have noticed that the bubble has come back but it is small, not the huge bubble I had before combining the two techniques. I noticed once I had the main pieces put together and the pockets sewn in, that the pockets flopped open. Ugh! What I did was fuse a piece of woven fusible stay tape along the pocket edge (the side that is facing outside). That worked like a charm - whew! So if any of you want to make View B of McCall's 7562, do stabilize the pocket edge along the top. Since I wanted to make sure the tape would stay put in the washing machine, I decided to secure it with a catch stitch. You can see I pinked the edges of the pockets...again, I did not want ridges to show through on the right side. 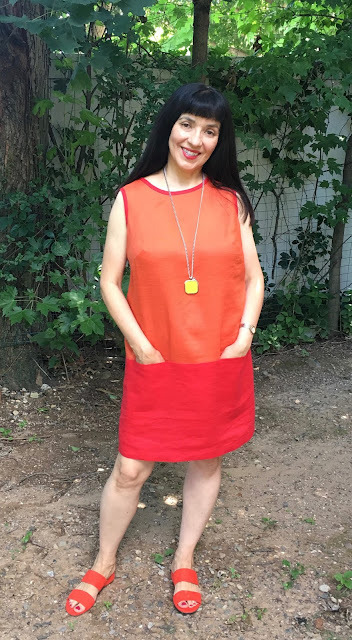 I did make a muslin of the dress to make sure the fit was just what I wanted. Everything was A OK in the muslin. I went ahead and cut out the garment and stay stitched the armholes. I was going to use purchased pre-packaged bias tape turned to the inside because I like the clean finish it provides. 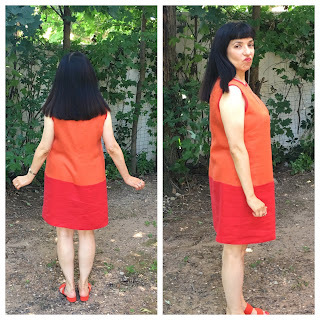 I used this technique on the neckline of my previous dress. So I applied the bias tape, turned it to the inside and topstitched. 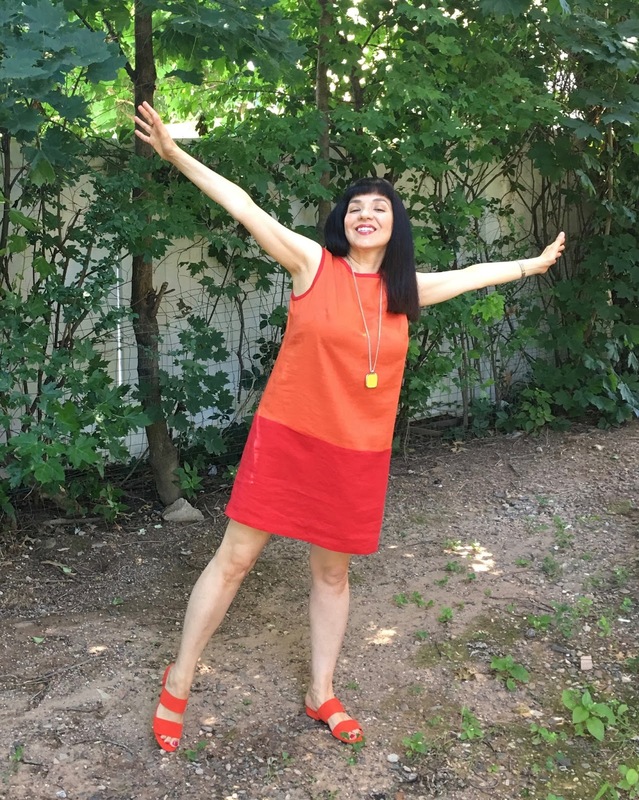 I tried the dress on and was horrified to discover that I had inadvertently stretched out the armholes. You could see most of my bra! Oh no! What to do? I was brainstorming with my dear sewing friend, Caryn. (She makes the most beautiful garments. She does couture level sewing. She is so very talented and an inspiration to me). 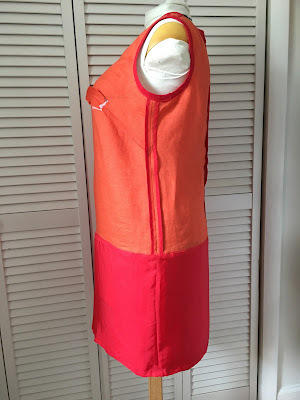 She suggested using fold over elastic in red since it would pull in the armhole and add interest with the red color. I thought it was a great idea except I was pretty sure I would not find the correct red. Instead, I decided to pull in the armhole with basting stitches and make my own bias tape from some of the left over red fabric. I proceeded to remove all of the bias tape I had applied, an arduous task indeed. WooHoo! 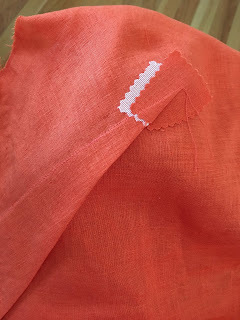 I do love the effect of the contrast trim along the armholes (thank you Caryn!) so I applied it to the neckline as well. I think that without the red trim, it would feel like something was missing. It was one of those happy accidents!! Here are the back and side views of the dress. I used an invisible zipper at center back. A shift dress is not the most flattering view from the side (thus the face) but overall, this dress is a great dress in vibrant colors that is cool and comfortable. Its simple silhouette belies how much work it was to put together, but it was worth it! 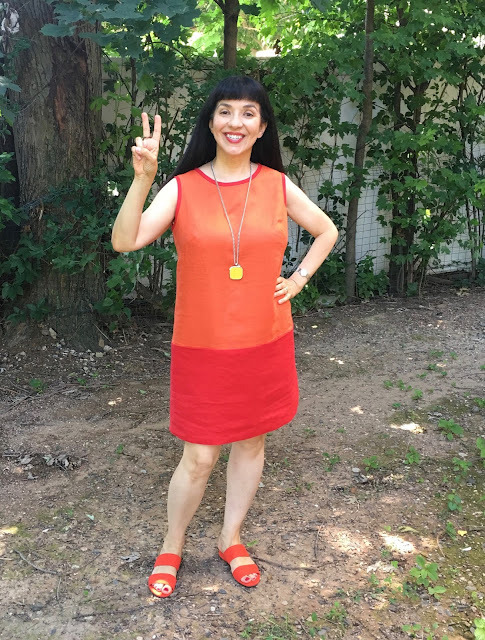 Until next time, peace, love and happy sewing!